The Glory of the Lord’s Day – God's Grace ~ God's Glory! God's Grace ~ God's Glory! 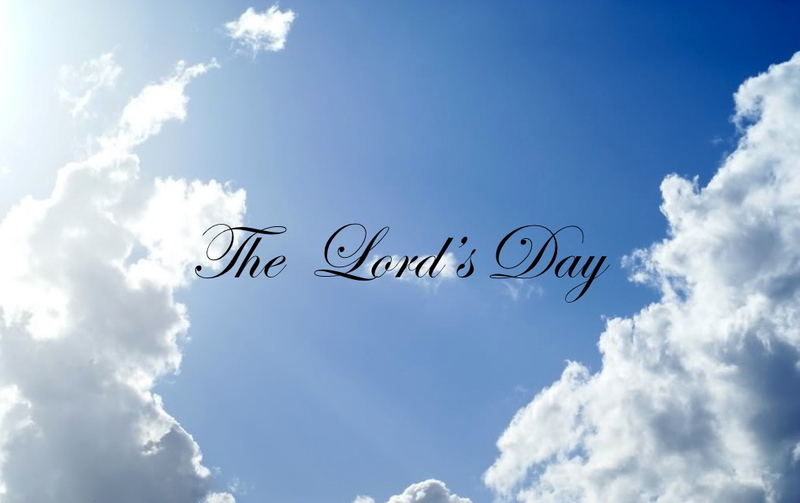 I am writing about the Lord’s Day to document for my own memory what the Lord has shown me about today, which I have learned to call the Lord’s Day. This day has different meanings for different people. Its meaning for me makes it a precious day for it is my Lord’s Day. For many years I have been convicted of what God not only says, but what He implies in His own word, about this day. With the conviction has come more revelation, more understanding, more commitment, more discipline and more joy. In His word I see a continual pattern of God’s will, His working, and His way established for His kingdom here on earth. As His children and joint-heirs of His kingdom with Christ, His Son, we not only have the privilege of the written law, but we have the law by His Spirit written on our hearts and in our minds. He not only reveals through His written word what He wants us to know about Him and His kingdom, but also by His Spirit works it in our hearts and lives. Remember that what I write is all from “a sheep’s view.” I want to share more on the subject as the Lord leads. The pattern from the beginning of time with His creation is continued through the work of redemption until we are brought to our final destination on what will be an eternal Lord’s Day. The first was a resting from the Father’s labor; the second, the Son resting from His labor; and the third, a resting for His entire kingdom, as the Holy Spirit works in us, preparing us for that eternal rest in glory. There is much that I could include in this document, but a lot of it would be what Jesus’ apostles, the early church fathers, the Puritans, the Reformers, and theologians have said. Documented in the London Confession, and others published before them are the statements of faith concerning the Sabbath. It is part of studying these, especially in the memorization of the Shorter Catechism with Scriptural proofs, that my convictions have been confirmed. Continuing to review these in prayer I seek to know and obey God’s word and glorify Him in this present day. I share today a scheduled Bible reading from Luke 23:52-56 for September 20. “This man (Joseph of Arimathaea) went unto Pilate, and begged the body of Jesus. And he took it down, and wrapped it in linen, and laid it in a sepulchre that was hewn in stone, wherein never man before was laid. And that day was the preparation, and the sabbath drew on. And the women also, which came with him from Galilee, followed after, and beheld the sepulchre, and how his body was laid. Jesus had finished His work of redemption and His body was laid to rest until the day of His resurrection. It was the day of preparation for the Sabbath. Why was Jesus’ death scheduled for this day? I have not searched this question, nor do I write here of its significance, except that it was God, the Father’s plan; and He established the Lord’s Day in covenant with His Son as the Christian Sabbath, the day in which we would weekly celebrate the risen Lord and Savior. Those who stayed around after Jesus’ crucifixion was Joseph, one of the counselors, who had not consented to Jesus’ death, and the women who had followed Him from Galilee. The apostles, in fear, had scattered. Joseph asked to take care of Jesus’ body, and the women returned home, and prepared spices and ointments for His burial. But these would never be used; because when they returned, after the Sabbath, the law of a seventh-day had been displaced by a new law of life in Christ’s resurrection. They rested the sabbath day according to the commandment, while Christ was establishing a new covenant for God’s people. He was resting while they were resting, but in a different rest for a different purpose. Preparation for the Lord’s Day and the practice of it today is in the fulfillment of God’s promises for an eternal sabbath. When we live, projecting from one Lord’s Day to another, we are practicing and preparing for Christ’s glorious return and eternity with Him. We go through each day of the week, in private worship, and making preparation under this projection, look forward to spending the day in the public and private exercises of God’s worship, as He has appointed in His word. God had appointed Joseph to ask for and prepare Jesus’ body for burial. We are commanded by Him to observe the day in His honor and in celebration of our new life in Him. We are to worship God through Him and the Holy Spirit in spirit and truth each Lord’s Day. We take part in the body of Christ, the church, in communion with His risen body, through the Lord’s Supper each Lord’s Day, remembering His death until He comes again. Would I have waited to see what or who would have been there for Jesus after His death? How do we now remember His death and resurrection? This is no longer a question for me; but in response to His sacrifice for me, mine is a sincere desire and commitment to spend the Lord’s Day with Him, without any division of time for other things. Next Lord’s Day, Lord willing, I will share some of the special parts of God’s word in reference to this day, and the Sabbath. How do you prepare for the Lord’s Day? Thanks for your presentation of the Lord’s Day as our celebration of His resurrection, and our resting in His accomplishments. Don, thank you for your visit and your comment. The Lord bless your new year.